140-160 CE. Marble, 82 in. (209 cm). At first glance these two portraits seem entirely different. However they both hint at the idea of body as costume. 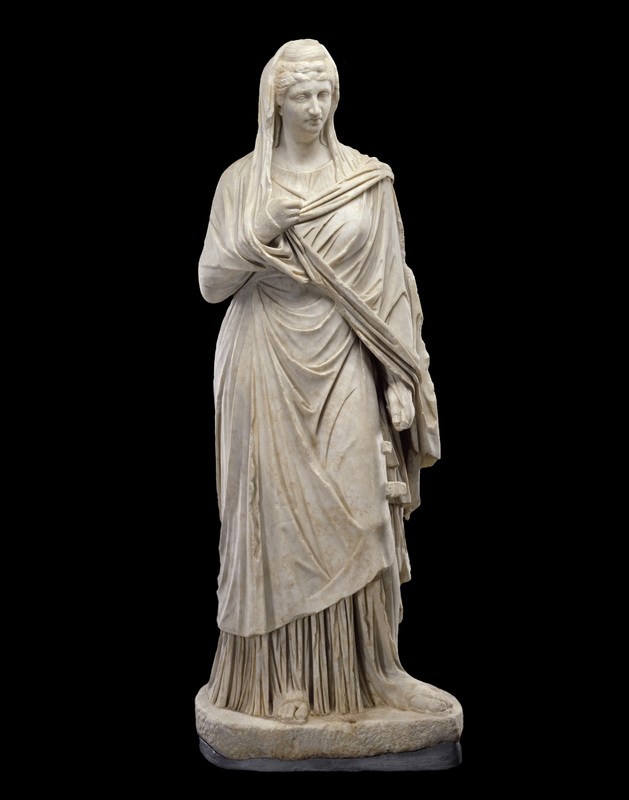 In the case of Faustina, her body is a 'stock' type – the Large Herculaneum Woman type – that many different women who were honored would have. Due to this, even though from her face we know her, she is robbed of her individuality. What becomes important when we look at her is that her clothing subtly informs us of her wealth and status – touting these qualities without being too obvious or unchaste. Additionally, the clothing of female statue bodies does not hold true to real life, where it would be expected to be thick enough to cover all curves.1 This means that despite the large amount of fabric, a woman's shape could often be seen under her clothing, hinting at her sexuality, which never could be openly alluded to. Similarly, Laura's tan lines give her the appearance of wearing clothing, or hint at clothing though there is none. And her body could be understood as a 'stock' type as well, as it hints at the golden skin and tan lines of someone living a certain kind of life – perhaps a Californian, or at least someone with the leisure time to sunbathe – but without implicitly informing us of Laura's social or economic status. Laura's tan lines have a similar effect as the clinging fabric of Roman sculpture – our eyes are drawn to what is emphasized – her breasts and pubic area. 1 Fejfer, Jane.“Roman Women in Public.” Roman Portraits in Context. Berlin: Walter de Gruyter, 2008.